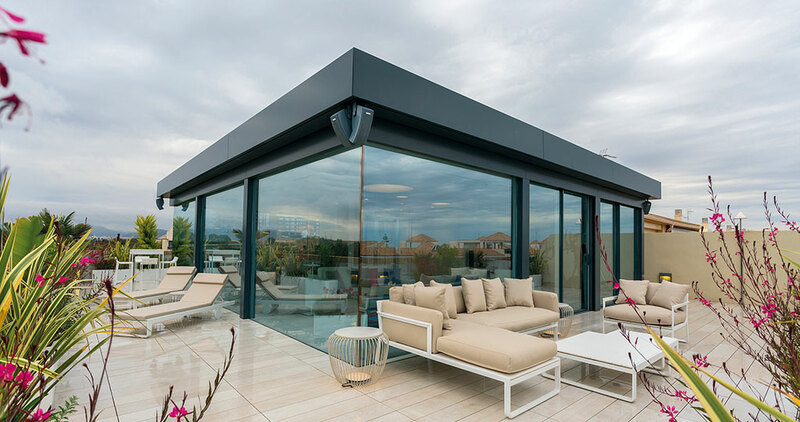 Relaxing and escaping from the stresses of daily life, while taking in some magnificent 360° sea views becomes possible through this exclusive penthouse in Canet de Berenguer, a project in which the PORCELANOSA Grupo has played its part. 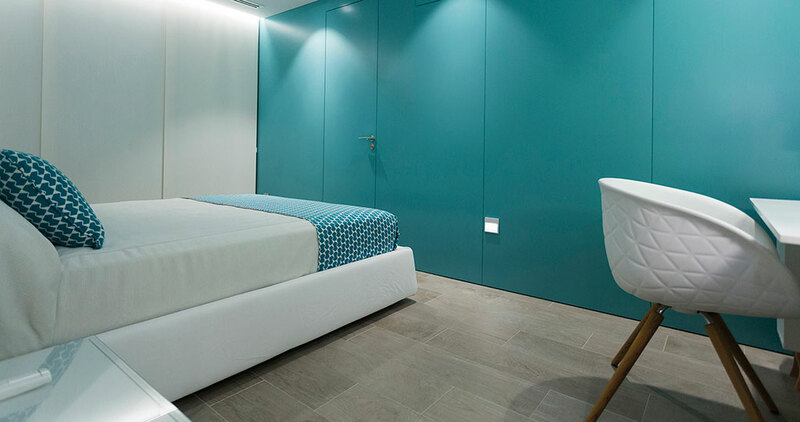 The architecture and design studio in charge of its refurbishment has been Octógono Castellón, which had to face two main challenges: firstly, to bring two independent apartments together in the same space, and secondly, to enhance the views of the Mediterranean Sea, by reinforcing the Living IN & OUT interior design concept. This way, a two-storey housing project came about, both spacious and clear, as well as being open, pleasant and comfortable, where the limits between interior and exterior become accessible, and at the same time, obscure. It is certainly a warm and cosy place with a notable and practical spirit. Seeking to increase the continuity and maximise the space to a great extent, Octógono Castellón carried out a project based on a modern minimal style, with light colours and a strong presence of natural light coming in from the outside. 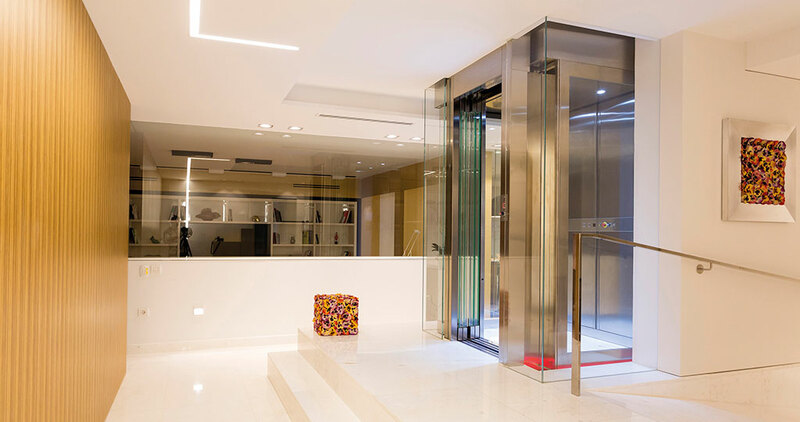 The arrangement of the areas is provided by the podium surrounding the entrance to a private lift, which works as the main organising element. On the ground floor one can find the eat-in kitchen and the hall, four bedrooms with private bathrooms and a dressing room in two of them. On the upper floor, a new hall and kitchen are located; a dining room and a gym, which take up the same clear open space, except for the bathroom and the washing area. This upper floor is a glazed area with more light and brightness and integrates the exterior views into the penthouse. The residential project also has an excellent perimeter terrace, which strengthens the idea of ‘outdoor life’ even more. This terrace almost completely surrounds the upper floor, which is entirely glazed. With several resting areas, it is completed with a barbecue area which is perfect for making the most of the sunny days. The interior design, developed by Manuel Dauffi, is based on a colour palette which is neutral in the public areas, and enhanced by lively colour shades on the cushions, rugs and the furniture. 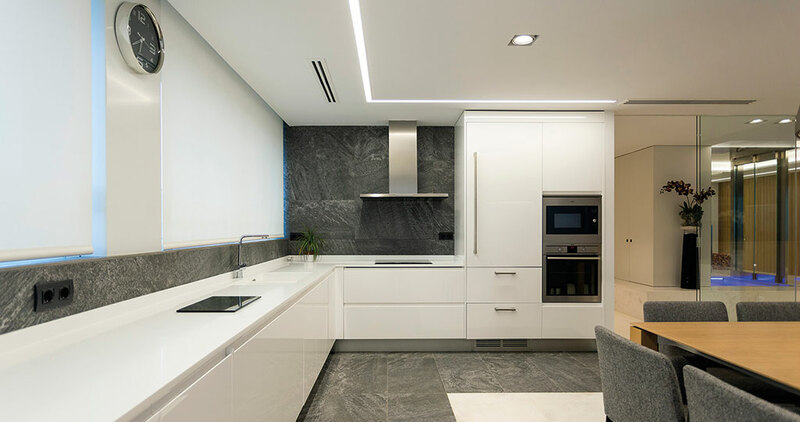 The architect, an expert in the numerous options offered by PORCELANOSA Grupo, banked on the products from the firm because of their beauty and ability to provide the set with value and outstanding quality. 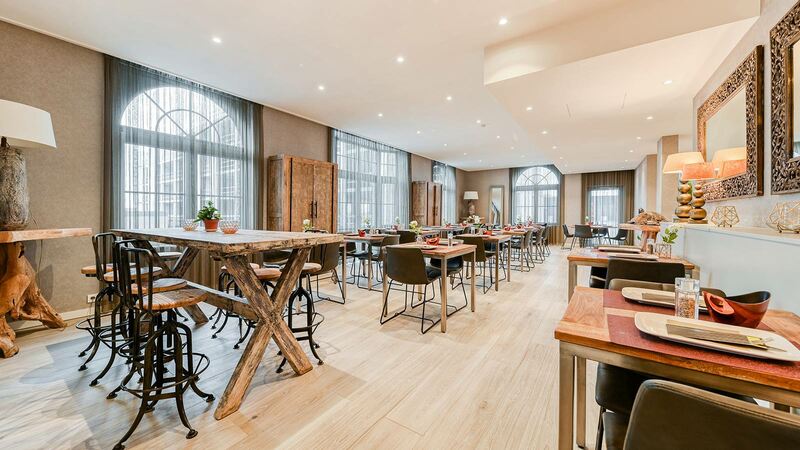 In the elegant sobriety of the communal areas, one can find the Zurich Ash flooring by Venis in light tones on the inside of the first floor. 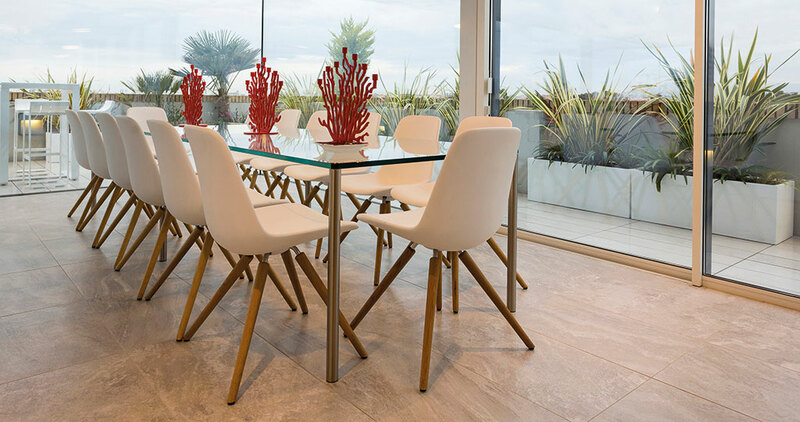 It is a highly-resistant ceramic flooring that has also been used in other areas such as the hall on the first floor. The model Nazca Antracita, also by Venis, is a design for flooring and ceramic wall tiles used in the kitchen, fitted with the Emotions design by Gamadeecor. The taps, for their part, are by Noken: the model Osmosis. Natural stone is one of the other materials which is worth highlighting in this project. 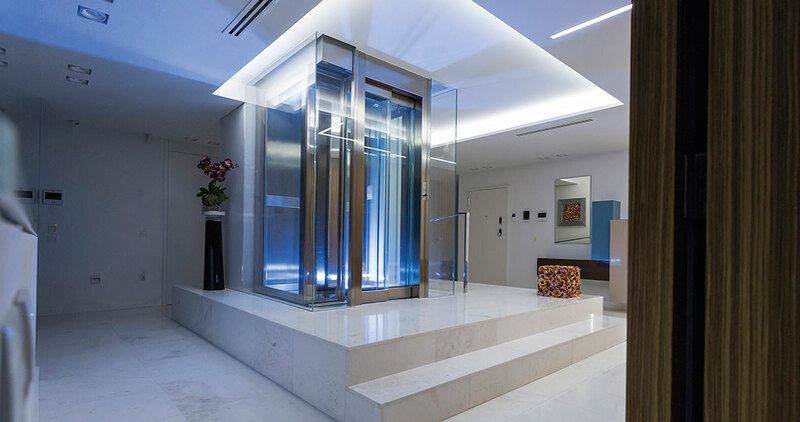 Specifically, the Persian White Pulido marble by L’Antic Colonial, installed as the flooring in both the hall on the ground floor and the private lift area. 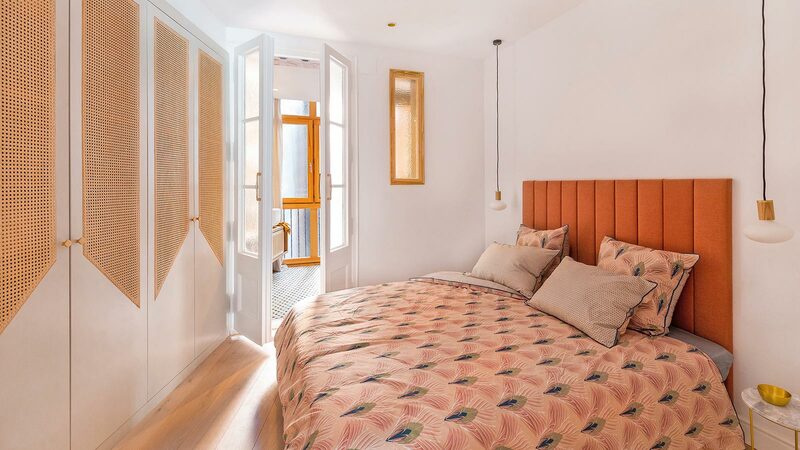 In the bedrooms, the architect managed to portray the personality of the inhabitants of the house by making use of a colour palette in the decoration that one cannot find in the rest of the house. A dynamism and customised character that are shown in the main room, with coverings in aquamarine blue, and the exclusivity of the wood-inspiring ceramic floor tile, the Oxford Natural by Porcelanosa. These spaces are technologically equipped and focused on maximum comfort for the guests. 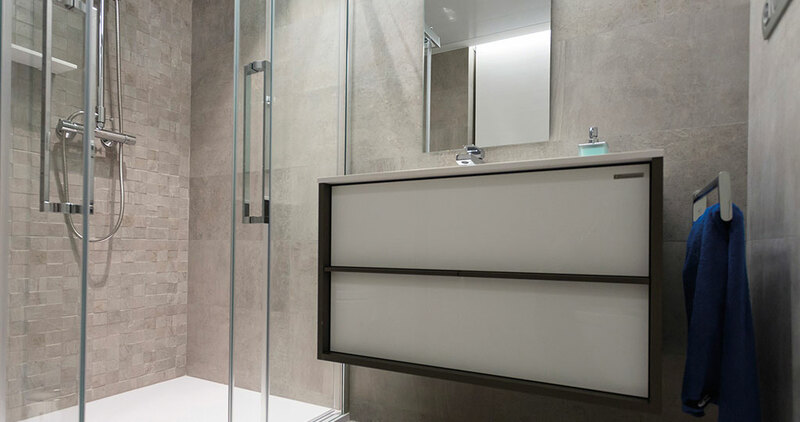 They combine quality and resistance to moisture, and easy maintenance regarding the ceramic tiles by Porcelanosa with finishes in stone and wood. One of the bathrooms joins the Rodano Caliza ceramic wall tile together with the Rodano caliza mosaic, whereas the other bathroom combines the Rodano Acero ceramic wall tile and the Rodano Acero mosaic. With regard to the bathroom fittings, for their part, one can find the Acro-N taps by Noken and the Folk furniture by Gamadecor. 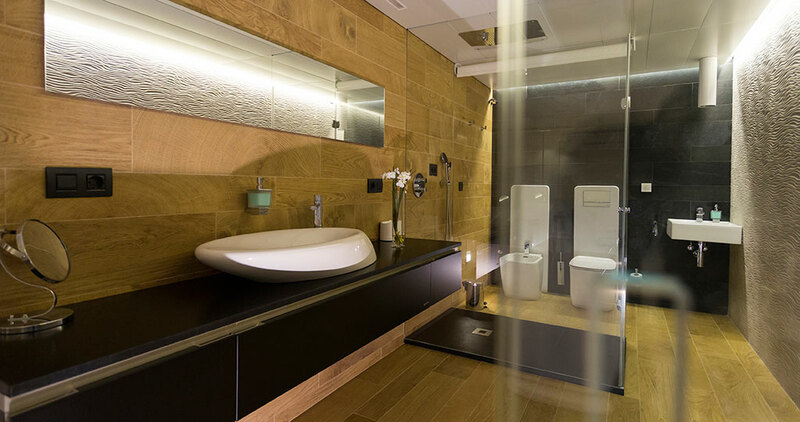 In the bathroom that is in the main room, which is fully glazed, the Tetris bathroom furniture by Gamadecor has been installed, and also the Essence-C sanitaryware by Noken, the Jam wall-hung basin by Noken, and the Season ceiling-mounted showerhead. 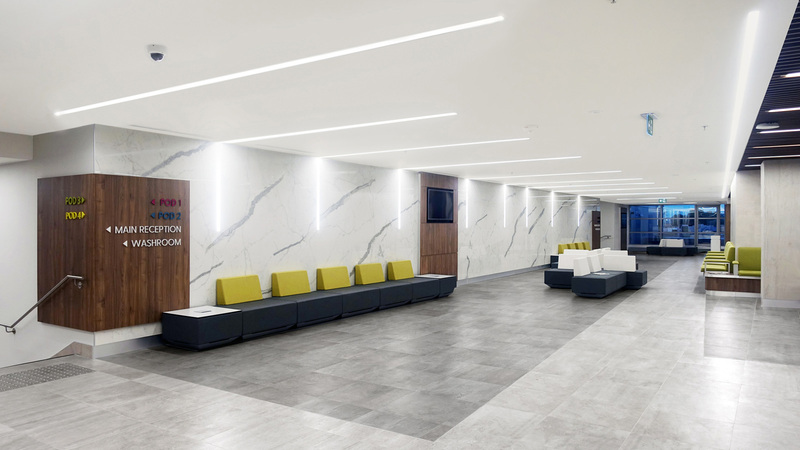 The Oxford Natural ceramic tile by Porcelanosa was the choice for both the flooring and wall tiles in this space. This is where the raised flooring made up of special pieces from Oxford Blanco by Porcelanosa, installed on a plots system by Butech can be found. 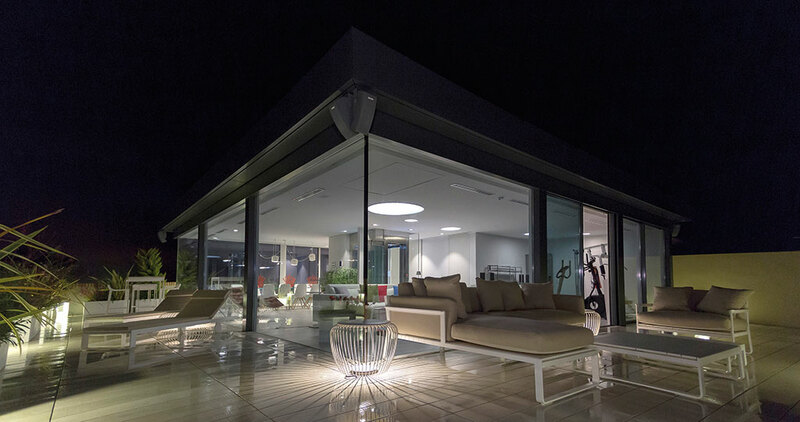 It turns out to be a perfectly suitable design for outdoor spaces. 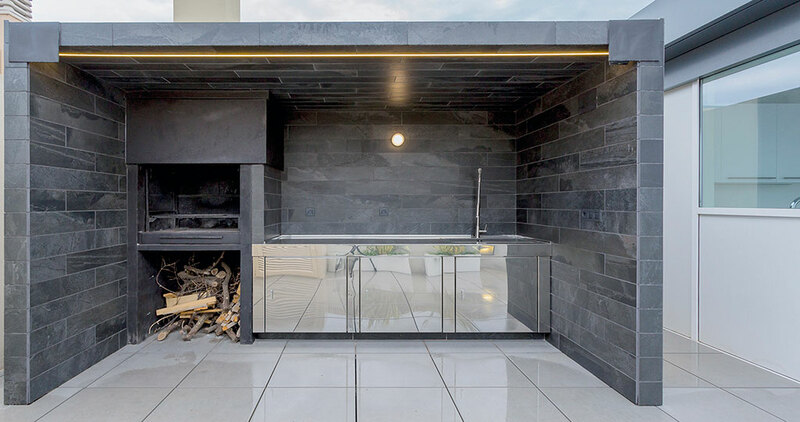 Additionally, the exterior barbecue has been covered by the Samoa Antracita ceramic collection, also by Porcelanosa. 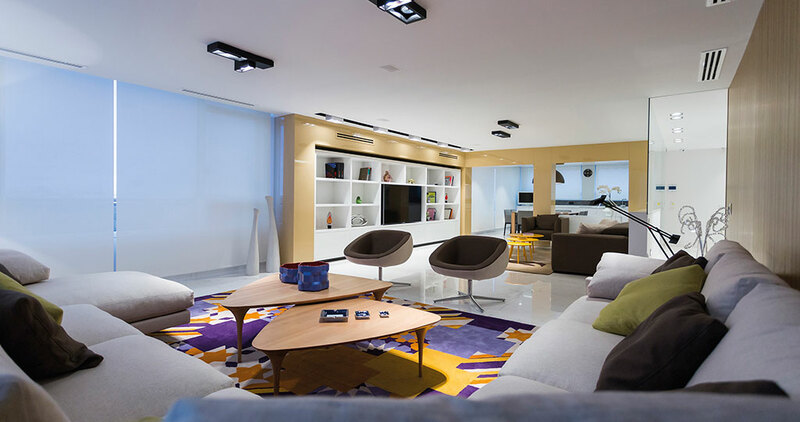 In conclusion, a unique penthouse which combines modern design with comfort and cosiness, making it become a place where anyone would really “fancy staying”, thanks to the innovation of the materials and products from the PORCELANOSA Grupo.